Providing you the best range of vintage wooden window, bar furniture, industrial cabinet, iron book shelf and metal cabinets with effective & timely delivery. 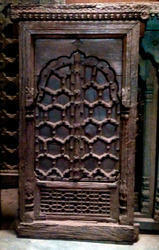 Banking on our years of experience, we are provided our clients a vast assortment of Vintage Jharokha Style Window. This window is checked by vendors quality experts for assuring its flawlessness. Offered window is manufactured by vendors workforce using best quality material in compliance with market norms. We are offering this window in customized options as per customer’s demand.